Question Does peripheral eosinopenia at the time of admission for Clostridium difficile infection predict higher inpatient mortality and other disease-related adverse outcomes? Findings In this cohort study, peripheral eosinopenia at the time of admission for C difficile infection predicted higher inpatient mortality. The predictive value of eosinopenia for this outcome remains for patients presenting with normal vital signs. 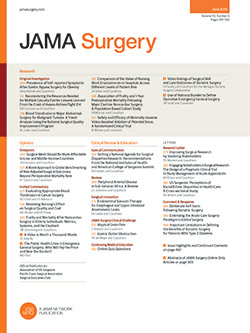 Meaning In animal models, peripheral eosinopenia is a biologically plausible predictive factor for adverse outcomes, and human data from this study indicate that this frequent addition to an admission complete blood cell count is an inexpensive, widely available risk index in the treatment of C difficile infection. Importance Recent evidence from an animal model suggests that peripheral loss of eosinophils in Clostridium difficile infection (CDI) is associated with severe disease. The ability to identify high-risk patients with CDI as early as the time of admission could improve outcomes by guiding management decisions. Objective To construct a model using clinical indices readily available at the time of hospital admission, including peripheral eosinophil counts, to predict inpatient mortality in patients with CDI. Design, Setting, and Participants In a cohort study, a total of 2065 patients admitted for CDI through the emergency department of 2 tertiary referral centers from January 1, 2005, to December 31, 2015, formed a training and a validation cohort. The sample was stratified by admission eosinophil count (0.0 cells/μL or >0.0 cells/μL), and multivariable logistic regression was used to construct a predictive model for inpatient mortality as well as other disease-related outcomes. Main Outcomes and Measures Inpatient mortality was the primary outcome. Secondary outcomes included the need for a monitored care setting, need for vasopressors, and rates of inpatient colectomy. Results Of the 2065 patients in the study, 1092 (52.9%) were women and patients had a mean (SD) age of 63.4 (18.4) years. Those with an undetectable eosinophil count at admission had increased in-hospital mortality in both the training (odds ratio [OR], 2.01; 95% CI, 1.08-3.73; P = .03) and validation (OR, 2.26; 95% CI, 1.33-3.83; P = .002) cohorts in both univariable and multivariable analysis. Undetectable eosinophil counts were also associated with indicators of severe sepsis, such as admission to monitored care settings (OR, 1.40; 95% CI, 1.06-1.86), the need for vasopressors (OR, 2.08; 95% CI, 1.32-3.28), and emergency total colectomy (OR, 2.56; 95% CI, 1.12-5.87). Other significant predictors of mortality at admission included increasing comorbidity burden (for each 1-unit increase: OR, 1.13; 95% CI, 1.05-1.22) and lower systolic blood pressures (for each 1-mm Hg increase: OR, 0.99; 95% CI, 0.98-1.00). In a subgroup analysis of patients presenting without initial tachycardia or hypotension, only patients with undetectable admission eosinophil counts, but not those with an elevated white blood cell count, had significantly increased odds of inpatient mortality (OR, 5.76; 95% CI, 1.99-16.64). Conclusions and Relevance This study describes a simple, widely available, inexpensive model predicting CDI severity and mortality to identify at-risk patients at the time of admission.